This is the final week of series called; “What do you want?” It is the question we read Jesus asking Bartimaeus who is blind and seeking Jesus’ assistance. It is also a question Jesus asks all of us. What do we want? As we close out the series, hopefully you have reflected on the question and have some answers. God, the creator of the universe stands ready to answer your response. So what do you want? Our first week we looked at this question, what do we want? We determined we were not made to be alone, in fact we decided we need to be together, we need one another, we need each other. We all come from the same origin, we are of the same flesh, we are united as one in marriage, we are consecrated by Jesus as one vast community, we are saved as one with our Savior, and we are many moving toward the glory Jesus provides. Although we are unique individuals, we cannot be alone, what we want is others in our life. Two weeks ago looking at the same question we noticed through the readings that God wants the best life for us. God wants us to have the best life possible and to be completely happy. We discover through wisdom of God, the word of God and by divesting of the things that can distract us from what is really important, that we want the best life. The things of the world, being a success at all cost, having the next best toy, generally trying to get satisfied by things is not what will make us happy, happiness comes from a who not a what. We must make room for relationships if we are to live a happy life, which is our best life. Last week looking at the question; what do we want? the readings gave us an answer from God’s perspective; God wants us to know we are valuable. God sends his Son who suffers, sacrifices and serves for each of us. This is God’s demonstration of our value. Once we recognize the value God places on us, we are encouraged to turn what we suffer, sacrifice and serve to others; to use our value to lift up another and demonstrate to them they too are valuable. How valuable? God tells us by stretching out his arms and dying there is nothing more valuable than us. If God thinks we are so valuable, then we must convince ourselves of our value. Serving others is God’s way of speaking into the importance of our life and it shows our Godly worth. We are God’s instrument to do the same to one another, speak to others of their value and God’s desire for them. Nothing is more valuable then who we are to God. 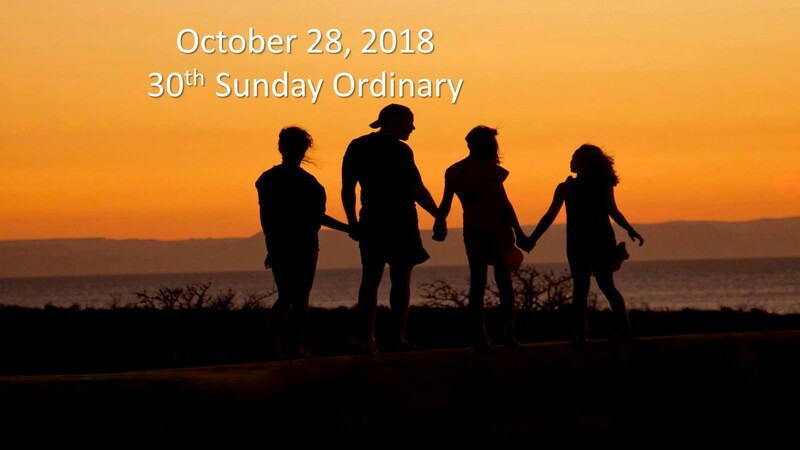 The readings this week are from the Lectionary for the Thirtieth Sunday in Ordinary time; We begin with; Jeremiah 31:7-9; Psalms 126:1-2, 2-3, 4-5, 6; Hebrews 5:1-6 and Mark 10:46-52. As we look at the question to each of us, what are you looking for, the readings show that God knows what we need and is already answering the question. From the first week, we don’t want to be alone, next week we want to have the best life, last week we want to be valuable and this week the answer is we want to see and let God lead us. In the reading from Jeremiah the Israelite’s are returning from their captivity in Babylon. Jeremiah speaking as God’s prophet is declaring God’s plan to bring back the remnant, to gather them from all the ends of the world, specifically mentioning the blind, disabled, and mothers, including those with children. They were taken from their homes in tears but now they are being consoled, and guided. The joy being expressed is God plan for anyone who returns to God. God has said he has loved us with an everlasting love. No matter our infidelities God is ready to take us back. We may have lost our way but when we return to God we are consoled and the path is made easy. God is our Father and his mercy is never ending. While we may lose sight of God, he never loses sight of us. The reading from Hebrews speaks of a great high priest, a representative from God, one who offers gifts and sacrifice for sins. This high priest is able to deal patiently with ignorance and erring, two types of sin, faults committed by mistake and those committed deliberately. The high priest is patient because he knows us, he became weak for us, and is able to be compassionate. God is the one who honors and calls this high priest, and the call is of God’s Son, our high priest forever, the one who knows the way to God. The sacrifice this high priest offers, is a sin offering that stands once and forever. Sin separates us from God, yet God’s forgiveness made ready by the high priest mediates this separation so that we may once again be near and follow God. Jesus is our high priest mediating on our behalf eternally. Through Jesus closeness to God is possible and he gives us the sight to know the path we must take. The readings reinforce the message that we may not see clearly and need God to help us see. Once our true sight is restored we come to know we must follow God. We see that after their infidelity and God’s mercy God is leading the remnant back home. We also learn that we have a high priest that clears away sin, the blockage that keeps us from seeing God, once sin is removed, our separation ends and we can follow God once again. This is reinforced in the story of Bartimaeus, who cannot physically see but really it is us who cannot see, and once Jesus restores our true sight, we can once again follow God. It is the constant through these stories, our sight is blocked, through sin, and once we can see we know that we must follow God. In the context of our theme; what do we want? the answer is we want to see and once we see we know we must follow God. We sin and separate ourselves from God but God never leaves us. God is constantly present trying to clear our vision so that we will come to know following God is truly our call. If we know a little about someone who is blind, we might know when their sight sense is not working, their other senses are heightened. A blind friend of mine lives very independently. He uses city bus transportation to travel. He shops, cooks, works in a professional field and even met the President of the United States. He didn’t let his blindness stop him from living as he wished. He uses counting and a blind stick to know where he is and how far to his destination. He doesn’t buy food in cans because they can’t be distinguished without opening the can. He places his money in his wallet in a certain manner, using folds so he knows which bill is which. He uses brail for reading, uses computer voice recognition for computer emails and documents. We never discussed it but I am sure he would have preferred to see. Yet, he never let his lack of sight hold him back from doing something he wanted to accomplish. Through technology and societal accommodation like beepers at street crossings he is able to live independently in this modern era. Bartimaeus doesn’t have these modern technologies to help him live independently, and it would seem his entire life is about begging at the city entrance to survive. For him, desiring a miracle is something that he probably prayed for his entire life. We know he did have some knowledge of covenant and the coming of the Messiah through his call to Jesus as the son of David. Most practicing Jews would know the story of the coming of a Messiah from the line of David. He would have grown thinking he was a sinner as this is the reason he is blind. However giving the chance for that miracle Bartimaeus asks Jesus for his sight. Jesus responds by restoring his sight. But once he can see, Bartimaeus knows that true vision comes from something more than being able to see. My friend too who cannot see, knows vision is bigger than seeing what is in front of his face. True vision is more than taking in the surrounding light, in fact true vision comes when we know to follow the “light of the world.” Both Bartimaeus and my friend enable true vision by becoming followers of Jesus. For those of us who can see what is our vision? Are we in search of success, achievement, greatness? What does it mean to be a great? Are we working to get life just the way we want it? Maybe we want to live for fun, travel, a party all the time where we are the life of the party. Or maybe we want to live independently, being able to do what we want when we want to do it. Maybe we want to be in charge, having power and telling people what do is what we think makes life great. Maybe we like making money, investing, increasing, and growing our finances. Maybe we are a doer, we like to make things happen, build things, being a leader that accomplishes things. Maybe we just want to be the best in our profession, a recognized authority in the field of our choice. Perhaps we want to be famous, a star, well-known somehow, and admired. Perhaps we think being great is meeting the standards of our neighbors, we have a nice home, a good car or two, great kids, going to good schools, playing sports with all the right stickers on our cars. We each might have a different idea about what it means to be living a great life, but we do have our idea of what living a great life means. But as we have looked at this question What do we want? Through the four weeks, we have seen God’s desire for what makes our life great. Jesus came to bring a Kingdom. Jesus Kingdom is not about individual greatness, individual riches, individual fame. In Jesus Kingdom the last are first, loving is required, even loving our enemies and making disciples is required. Jesus Kingdom is not like a Kingdom the world would build, it is completely the opposite. But it is a place that brings peace, creates happiness, and serving is valuable. Keeping the question in front of us over these past four weeks; what do we want? First we see we need each other. We are not meant to be alone. We might desire a small circle of people in our life but we really must be open to everyone. We are dependent on one another, in fact we need one another. What we achieve only means something when there is someone who we can share it with. What we do can only be fulfilling when we do it with someone. How we live has more meaning when we live with someone. Next we see God wants us to have our best life. This best life comes when we are happy. We are happy when we have peace. Our happiness comes from a who not a what. Happy people are at peace with themselves, with others, with God. We live best when we happy, which is what God wants for us. God wants our happiness and declares we gain it by loving others, and loving God. God teaches us how to avoid sin, which separates us from God and others. Jesus prioritized peace with God, ourselves and others. To live our best life we must have peace. We also see God wants us to know we are valuable. Jesus suffered, sacrificed and served so we would know how valuable we are to God. But also we are called to offer our suffering, sacrifice and service for others. It is when we serve that we are at our most valuable. Life is not about what we get but what we give. The life Christ lived is the life we are to mimic. Christ came to serve not be served. For us to live in the likeness of Christ we too must serve. Then we are at our most valuable. Finally to truly see we must have vision, not sight to see what is in front of us. Vision allows us to know we should be followers of Christ. Following Christ leads to a life of happiness, a life of vision. Our life requires a who; that who can be others who lead us to peace, it can be ourselves being at peace with who we are, but mostly it should be God who brings us ultimate peace. What do we want God to do for us? We want to see. Seeing we want to follow Jesus. Following Jesus we discover our value. Knowing our value we realize we must have others in our life. Having others in our life we know we need to be at peace with them, with God and with ourselves. We want to be needed, serving, valuable and part of the Kingdom of God. We want all God has to offer.